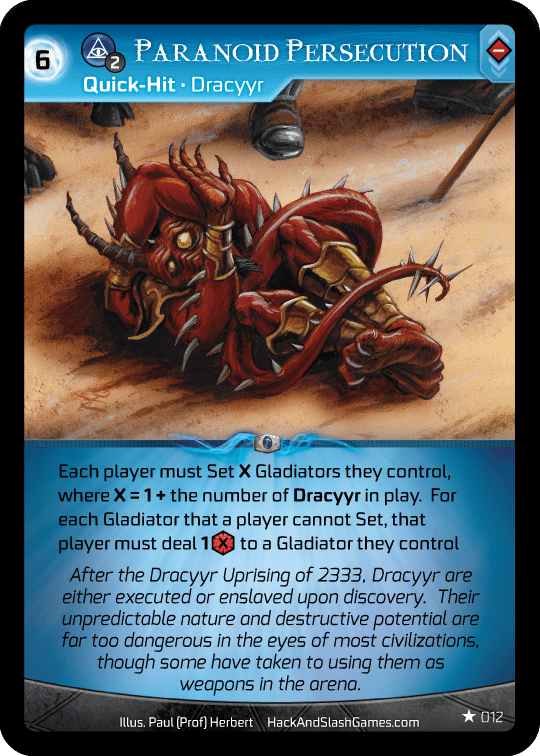 Gametext: Each player must Set X Gladiators they control, where X = 1 + the number of Dracyyr in play. For each Gladiator that a player cannot Set, that player must deal 1 <XDMG> to a Gladiator they control. Flavor Text: After the Dracyyr Uprising of 2333, Dracyyr are either executed or enslaved upon discovery. though some have taken to using them as weapons in the arena. The People’s Champion mini-expansion brought the Dracyyr to the Ophidian universe as a new mechanic, based on the Dracyyr keyword. This card doesn’t have a lot of Dracyyr to target (yet) but you can expect to see more cards with the Dracyyr keyword in the future. It’s the only Psionic card in 2360 that can deal direct Damage to a Gladiator. Look for this to be something that you can take further advantage of in the future as well! Still, this card is still useful when played at the right time. In fact, it might even make sense to use it just to get your Character Raging, though it’d be pretty expensive for that purpose. When your opponent is completly Set, this can be a nice additional amount of Damage, and remember, Direct Damage ignores Shields, and does not trigger Rage responses as it’s not an Attack. Rules Note – This card cannot count itself as a Dracyyr card “in play” because Quick-Hit cards are never “in” play. Cards that remain on the table are in play, such as Characters and Pumps.